Bulgaria offers 7 major mountain ranges within very close proximity. Each range and its villages are unique and offer their own special terrain, flora and fauna, and cultural heritage. The extensive network of marked hiking trails, hizas (chalets) and the experienced mountain rescue service make visits all year round possible. Rhodope is the birthplace of Orpheus and Dionysus and is still a haunting and mysterious place. Although relatively low, these mountains possess their own distinctive beauty, and are an ideal place for a hiking or biking excursion. Unique natural sites in Rodopi include: Trigrad and Buynovo canyons, interesting caves, the Wonder bridges as high as 40m /131 ft., the rocky “mushrooms” of Beli Plast, and the Zimzelen Rocks. Architectural sites in the area include the villages of Shiroka Luka and Kovachevitsa. The archaeological site Perperikon is of world importance. The Holy Mountains of Assenovgrad hold some of the oldest Bulgarian monasteries – Batchkovo (1089), Arapovo, and Muldava. Rodopi lies on the border with Greece, and the culture and climate have obvious Mediterranean influence. Bulgarian Muslims live in many of these villages; interesting mosques dot the landscape. Sheep and goats are herded from villages into the lush surroundings for daily grazing. Pirin takes its name from Perun, the Slavic thunder god, who was said to dwell on Mt. Vihren (2914m /9557 ft.), the highest summit of the range. These mountains are the wildest and most rugged of the Bulgarian ranges, the northern part having a truly alpine relief with jagged peaks, sharp crests, numerous glacially sculpted circuses, and over 170 glacial lakes. Pirin Mountains is declared a National Park. The connoisseurs will appreciate the dramatic sand pyramids of Melnik and its fine red wine, the quality of the murals in nearby Rozhen Monastery, the endemic flora. Bansko lies on the foot of Pirin Mountains and is nowadays a big ski resort. Horse drawn carts clatter down cobblestone streets, locals gather in the streets to shell beans, dry tobacco, and chat with neighbours. Rila has a rugged, alpine beauty, with rocky ridges, bristling peaks, plunging precipices, numerous wildflowers, and more than 180 sparkling lakes and streams. The name is derived from a Thracian word meaning “rich of water”. Mt. Moussala (2925m /9594 ft.) is the highest mountain in South-east Europe. Malyovitsa area is the place where Bulgarian alpinism made first steps. Rila Mountains is declared a National Park. 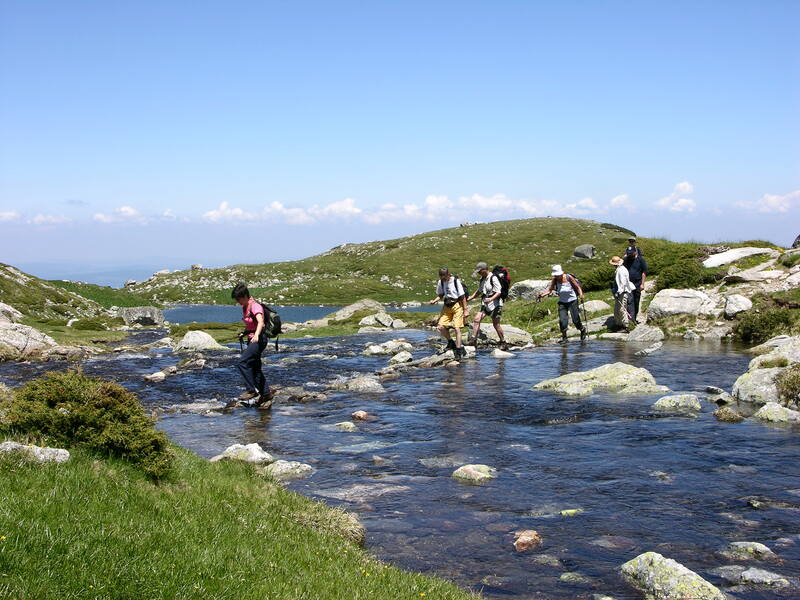 The Rila 7 Lakes is an area where you will feel a special sun-energy while hiking. This is the yearly meeting place for followers of the sun-worshipping sect founded by Peter Dunov. The exceptional Rila Monastery, the old city-centre of Blagoevgrad, and the fabulous churches of Dobarsko and Samokov are interesting sites in the Rila area. The Balkan, also called “Stara Planina” (Old Mountains) is the longest chain in the peninsula, stretching for over 600 km /372 miles. It is the natural border between South and North Bulgaria. The Balkan offers spectacular natural sites: the Iskar River canyon; the Belogradtchik Fortress, located amidst a vast area of bizarre rock formation; the Vratsa area offers phenomenal climbing and caving. The central part of the Balkan is declared a National Park and there are numerous reserves. The architectural masterpieces of Veliko Tarnovo (historical old town and impressive fortress), Arbanassi, Bozhentsi, and Tryavna are situated in this region. Troyan, Sokolsky, Kapinovo, and Kilifarevo monasteries are all of particular interest. Vitosha rises up just beyond the outskirts of Sofia. Inhabitants flock to its slopes on weekends, and small villages are scattered near its base. A gondola and lift offer easy access. Cherni Vruh peak, at 2290m /7511 ft., is the highest point. Two nature reserves with unique mountain flowers and herbs are located on the Vitosha Plateau and moraine “Rock Rivers” are a typical and impressive landscape. In the winter Vitosha offers good skiing and snow shoeing.